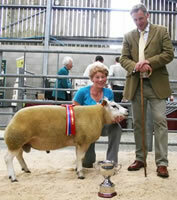 Sue Wilkinson, with her Skipton Beltex supreme champion, joined by judge Alan Jackson. 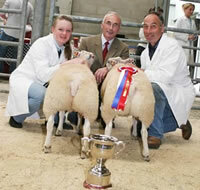 The couple, who made their debut at the 2009 show, carried off top honours at this year’s renewal with their first prize shearling ram and male champion. The home-bred victor, recipient of the Ivan Ashton Memorial Trophy, is by 2008 Royal Highland Show breed champion Brickrow Kaka, acquired the same year by the Wilkinsons. The dam is a Headlind Kalo Kalo-sired home-bred ewe. Sue, the Beltex “boss,” according to her builder husband, was also responsible for the reserve female champion with her class-winning shearling gimmer. For good measure, she also had the third in class, the pair split by the runner-up from Anne Story, from Hobbiesburn, Longtown, Carlisle. Anne, the 2009 Skipton supreme champion – also performed well this year when sending out the second prize shearling ram and reserve male champion, along with the first prize ram lamb. 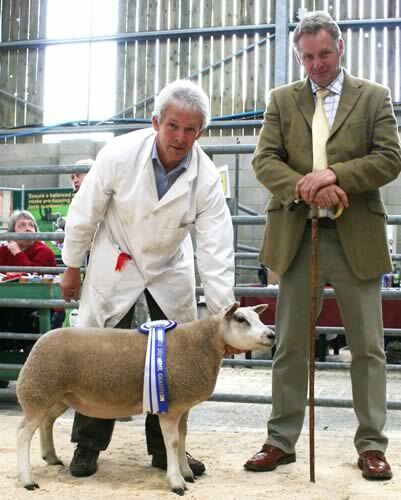 The 2010 reserve supreme championship fell to the female champion ewe lamb – one of the first prize pair of lambs - from North Craven’s Stuart Currie, of Beautry House, Rathmell, Settle. She is a daughter of Rathbone Leader, who was also responsible for Stuart’s supreme champion at last year’s follow-up September Beltex show and sale at Skipton. Stuart says he will be back at this year’s fixture on Saturday, September 11, with three well-bred shearling rams from Rathbone Leader’s third crop. In fact, a good number of progeny show entries are expected to reappear at next month’s show and sale. Local exhibitors Karen and David Shuttleworth, of Heber House, Gargrave, who only started breeding Beltex sheep recently, achieved a memorable brace of victories on their first-ever foray into the exhibition arena when sending out both the first prize gimmer lamb and the class-winning aged ewe from their debut five-strong entry. 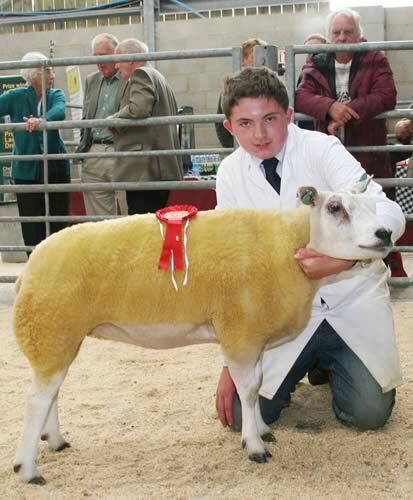 First prize in the aged rams class fell to James Bailey and Tommy Kitching, of Ivanhoe, Leyburn. Beltex stalwart, David Findlay, of Birdridding Farm, Coverham, Leyburn, sent out the first prize pair of shearlings, while his daughter, 14-year-old Charlotte Findlay and Will Ashton, 13, won the class for three ram lambs by the same sire. 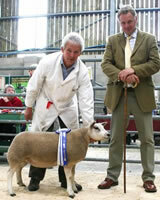 Successful in the same-sire gimmer lambs trio class was Mark Jennings, of Kendal. 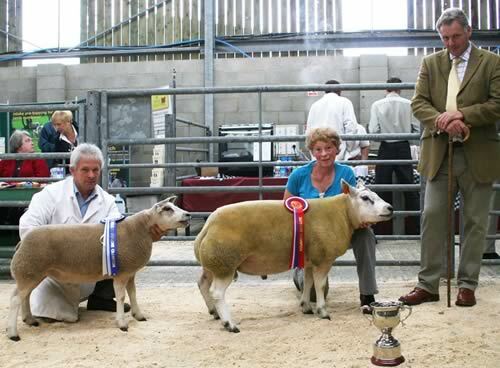 As in previous years, the commercial lambs section was again dominated by the renowned Beltex-breeding Brown family - husband and wife Martin and Val, and their 15-year-old daughter Hannah, of Beechwood House Farm, Newton-le-Willows, Bedale. With their victorious pair of 40-44kg home-bred twin lambs, the Browns were winning the Skipton title for the third year in succession, following up on other Beltex butchers’ lambs championship successes this year at the Great Yorkshire, Otley and Borrowby Shows. The Browns were also responsible for the supreme champion at the inaugural National Progeny Show at Skipton in 2006, as well as landing the reserve championship in 2007. This year, that honour fell to daughter Hannah, a pupil a Bedale High School, with a lamb that had earlier won one of the young handlers classes. 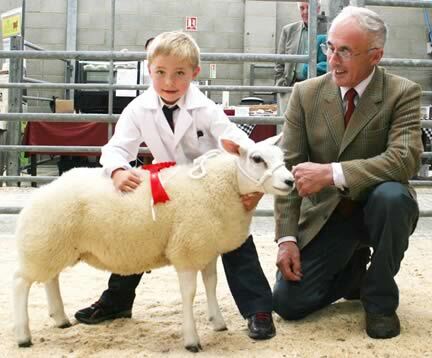 Two further prize classes for young handlers fell to six-year-old Giggleswick School pupil Matthew Garth, of Keasden, Clapham, and Henry Jewitt, 15, of Romaldkirk, Barnard Castle. Henry attends Teesdale Secondary School. Other butchers’ lambs class winners were George Cropper, of Baxenden, Accrington, Ian and Mary Lancaster, of Wiswell, Pendle, and Northern Beltex Club chairman Robert Garth, of Birk Knott, Keasden. Supreme champions in each section were competing for £500 prize money, with £100 going to both reserve champions, along with cash prizes for the first three in each class, courtesy of support from a number of show sponsors.